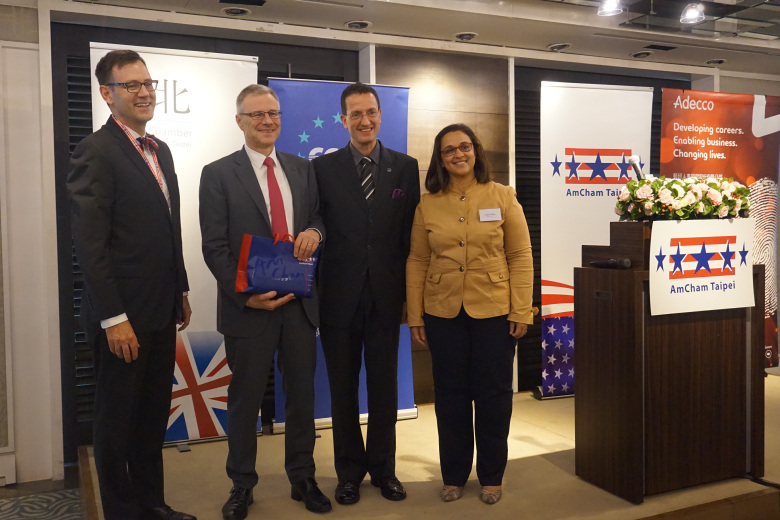 The ECCT hosted a lunch together with the British Chamber of Commerce Taipei (BCCT) and AmCham on the subject of megatrends shaping the world of work, featuring guest speaker Alain Dehaze, Chief Executive Officer of The Adecco Group. Among other subjects, the speaker spoke about employment trends, the role of corporations in developing talent and skills, how corporations can add value to education systems, and the role that talent plays in boosting productivity. We are living in a VUCA world (volatile, uncertain complex and ambiguous). An ever-growing proportion of the workforce does not have stable, fixed working contracts, conditions and benefits. Technology, especially automation, digitalisation and artificial intelligence are making more workers obsolete. At the same time, populations in most developed countries are facing declining birth rates and rapid aging, resulting in shrinking workforces in many of them. According to the speaker, 75% of the world’s robots are being installed by just five countries: China, the United States, Japan, Germany and South Korea. With the exception of the United States, the other four face rapidly-aging populations and shrinking workforces. Of all the trends, Dehaze believes that AI is going to be the most disruptive since all industries with high degrees of repetitive processes, including banking and insurance, will be transformed by AI, displacing thousands of workers. A great deal of flexibility and innovation will be needed to deal with the challenges that these trends pose. Employers need to adapt to the needs of their customers and employees. Rapid changes in technology mean that many skills become obsolete over a shorter period of time. This will require that people learn new skills periodically. Lifelong learning will become the norm. According to the speaker, employers should reassess their ways of adapting to the megatrends. When markets change and worker’s skills become obsolete, the traditional approach of corporations has been to lay off existing workers and hire new workers that have the required skills. However, this approach has both financial and social costs. In addition to having to pay severance and hiring costs, corporations suffer reputational damage when they lay off workers. Moreover, it may actually be more cost-effective to retrain existing workers than to lay them off and hire new workers. According to the speaker, one of his clients decided to retrain workers rather than go through the process of layoffs and rehiring based on analysis that the overall costs of retraining were just 30% than the costs of layoffs and rehiring would have been. There is also a silver lining to aging populations (pun intended). As people live longer, there will be a rise in the number of jobs in industries such as healthcare, life sciences and leisure industries, catering to their needs. Employers also need to adapt to the needs of the next generation. According to Dehaze, millennials tend to be much more purpose-driven in seeking jobs and projects that have an impact. It is difficult for employers to attract and recruit talent if the kind of work they do does not makes an impact. The rise in the so-called gig economy, where an increasing proportion of the workforce does not have a single employer, also poses a significant challenge to governments. Most current social safety nets were created in an era where it was expected that people would work for a single employer for most of their lives. Today, a large proportion of people in the gig economy have no provisions for healthcare, retirement or lifelong learning. Governments will need to devise new mechanisms of social protection that cover the entire workforce and provide both flexibility and security. According to the speaker, companies should also consider training as an investment, not a cost, and governments should recognise investment in human capital as an asset and provide incentives to encourage companies to invest in training (or reskilling), rather than layoffs and rehiring. For example, they should offer tax breaks and allow companies to amortise the costs of training over a number of years. During the Q&A, the speaker answered several questions from guests. On the subject of universal basic income (UBI), the speaker referred to a referendum calling for UBI in Switzerland (that failed to pass) and an actual UBI experiment in Finland (which has since been discontinued). He expressed the view that while governments need to provide a secure social safety net, UBI is not the answer because work has been shown to be the best social integrator and simply giving people money without having to work for it does not help them to feel better about themselves.